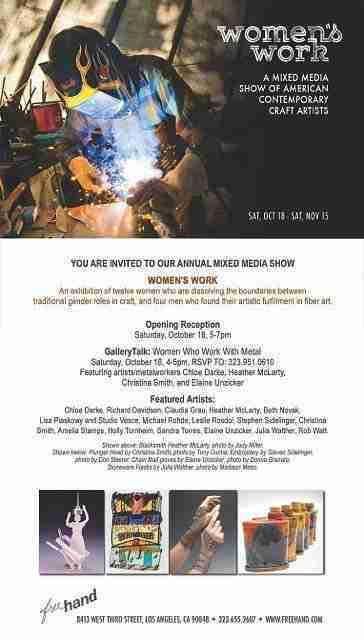 Not only will Elaine’s work be on display (including on models who will be circulating at the opening), in addition Elaine will take part in a panel discussion focusing on women working in metal. The opening is Saturday, October 18, from 5 pm to 7 pm. It’s a great chance to see Elaine’s work in a local venue and meet her as well as the other artists represented in the show. Freehand Gallery has been in the same spot since 1980 when it opened as one of the first galleries representing fine craft artists. The owner Carol Sauvion, also founded Craft in America, an organization which has a produced a Peabody award-winning series for PBS, a book and a center near the Gallery.